World of Warcraft devs are sharing more and more details on the MMO's next big patch as its inevitable release is gets closer. Besides improved flight paths, one of the recent and most interesting changes announced for the update, shared by community manager Crithto, will be a Garrison NPC who'll sell all the followers—buddies you can send on mini-quests—you potentially missed during your playthrough of the expansion. That'll be a nice addition, since some of the followers in Warlods of Draenor are very easy to miss or can't even be acquired if you've taken a certain path with the quests and outposts. 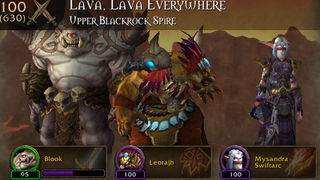 Remember the Shadowmoon Valley quest chain where you had to choose between three followers? This'll make things a bit easier and it'll be another possible gold sink. It also raises some questions, though. The max amount of active followers you can have right now is 20 (or 25 with the Barracks) and it's already more than enough to cover all the available max level missions in your Garrison. More missions with a bit more interesting rewards other than gold or XP would be awesome, for example, but we'll see. Patch 6.1 is still weeks away.